Flathead Audubon Society participated in the creation of the Alvord Lake Community Forest. The Alvord Lake Community Forest Project grew out of a community effort that began in 2002 to protect the last parcel of private land on Alvord Lake. This 142-acre parcel is situated on the southeast shore of Alvord Lake. It provides important fish and wildlife habitat, and offers numerous recreational opportunities for the local community. When the Vital Ground Foundation began working with the members of the Troy and Libby communities in 2013 to help achieve their goal, planning began to coalesce around the concept of creating a Community Forest to protect this lakeshore piece. Alvord Lake is in Lincoln County, two miles north of Troy. The new Community Forest is bounded by Kootenai National Forest to the west and Stimson Lumber Company lands that are protected by the Kootenai Valleys conservation easement to the north and east. (See map.) Conservation of this parcel will maintain habitat connectivity across this important forested landscape for a variety of wildlife including grizzly bears, moose, elk, fisher, lynx, wolverine, nesting common loons, great blue herons, osprey, bald eagles, spotted frogs, western toads, and painted turtles. Vital Ground Foundation, a national non-profit land trust based in Missoula, obtained a $400,000 grant from the National Forest Service’s Community Forest and Open Space Program in June 2014 that provided major funding for the purchase of the parcel. The remaining approximately $350,000 needed for the purchase came from a variety of sources including the Montana Fish & Wildlife Conservation Trust, Cinnabar Foundation, Vital Ground Donors, corporate sponsors, several other foundations, and three Montana non-profit partners: Flathead Audubon, Montana Loon Society, and Flathead Wildlife Inc. See the Alvord Lake Fact Sheet for more details. Flathead Audubon supported the project in two ways. In 2013 FAS sent a letter to the Forest Service recommending approval of the Vital Ground application for the Forest Service Community Forest Grant (FAS Correspondence on Alvord Lake Community Forest Grant). And in 2014, the FAS board unanimously approved a donation to Vital Ground of $5,000 from our Jack White Fund for the project, which was then used successfully to leverage other grant funding. The purchase was completed in December 2015. Vital Ground has obtained a Landscape Restoration Grant from DNRC to begin forest restoration and weed management activities in summer 2016. 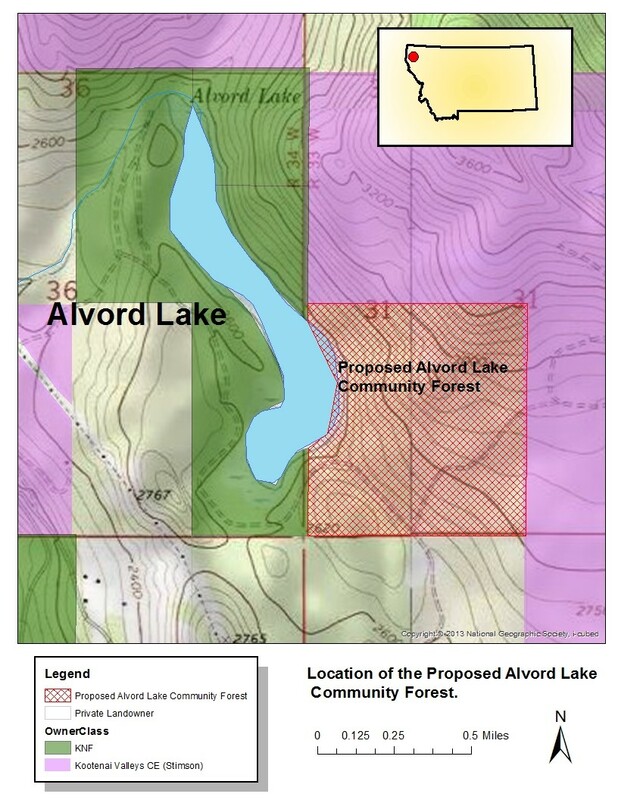 The Alvord Lake Community Forest will continue to be managed by Vital Ground according to the approved Community Forest Plan with the help of the Alvord Lake Community Forest Stakeholders. A celebration of the completion of the Alvord Lake Community Forest Project was held at the Alvord Lake Outdoor Classroom on Saturday, July 28, 2016. Flathead Audubon organized a car pool from Kalispell for those in the Flathead who wanted to attend, and helped in various ways with the Celebration. Click here for details and for a report on the Celebration.